The ‘Black Spider’s’ visits to Calcutta are part of the city’s football folklore. Yashin captivated Indian crowds and was also the inspiration for the country’s greatest goalie, Peter Thangaraj. On a pleasant late-February day in 1955, there was a lot of excitement over a sporting event in Bombay. A world class foreign sports team was in the city to take on a very good Indian side at the Brabourne Stadium on Marine Drive. No, this wasn’t a cricket match between India and England or Australia, but a football friendly between the host country and the Soviet Union. A Soviet team captained by Igor Netto and featuring stars such as Nikita Simonyan and Boris Tatushin took on an Indian team whose best player was Bombayite Neville D’Souza, the man who, a year later would become the first Asian to score a hat-trick in the Olympics. The Soviet team of that time was definitely better than its Indian counterpart, but then it had an unfair advantage, in the form of Lev Yashin or ‘The Black Spider’. “It was impossible to score off him; he was like the Berlin Wall,” says Fredo Lobo, a former university level football player who watched the match at the Brabourne. Lobo, who is in his 80s, says the match was over “in the third minute” when Nikita Simonyan scored the first goal. “India attacked and came close to scoring many times, but Yashin was unbelievable,” Lobo says. Simonyan scored again in the 55th minute of the match, which was watched by 35,000 fans at the city’s famous cricket stadium. The Soviet football team visited India in February-March 1955, in what was the first major exercise in diplomacy that culminated in the famous Nikita Khrushchev-Nicholai Bulganin trip later in the year. This was essentially the same team that would win the gold medal at the Melbourne Olympics in 1956. In three matches played in Bombay, Delhi and Calcutta, Yashin did not allow a single goal. Bombay was never a football-crazy city and few people in what is now Mumbai would have even heard of the match that was played almost 60 years ago. When it comes to passion for the sport, no city in India can even close to Calcutta, which fondly remembers the visit of Yashin and the Soviet team. On that tour, the USSR also played one of the city’s two iconic clubs, Mohun Bagan, in a friendly. Again, there was no getting past Yashin in that match. The star footballer came back to the city 18 years later as the chief guest of the final of the IFA Shield, which was the most prestigious club-level football tournament in India. Yashin presented the large shield to Mohun Bagan’s rival East Bengal, which defeated Pyongyang City Club in the final. The Black Spider’s visits are part of the city’s football folklore. He was the first in a line of the game’s greats to visit the city including Terry Paine, Pele, Maradona and most recently Lionel Messi. 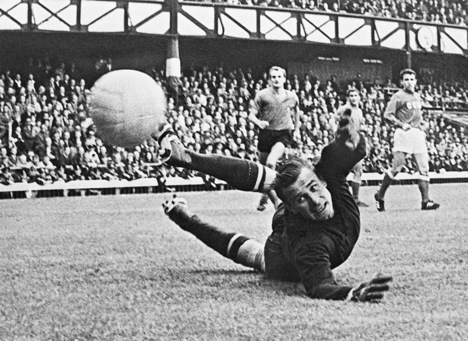 Between his two trips to Calcutta, Yashin went on win the Olympic Gold medal in Melbourne, the European Championship in 1960 and was awarded the Ballon d'Or in 1963, making him the only goalie to have that honour. In the 1956 Olympics, the Soviet Union won the gold medal and India made it all the way to the semi-finals, finishing ahead of Great Britain and Germany. The backbone of that team was India’s goalie Peter Thangaraj, a man who was inspired by Yashin from what he saw when the Soviet team visited India a year earlier. “When I watched Lev Yashin of Russia keeping the goal, I was inspired even more by his style,” Thangaraj said in an interview in 2002. “Yashin was the best in the business during his time, so I used to watch him keenly when he practised in the morning during his visit to India. Later, he gave me some tips,” he added. Thangaraj could have had a dream final match-up against Yashin in Melbourne, but India fell short in the semifinals against a dominant Yugoslavia. As underdogs, India put up a spirited performance and had a 1-0 lead until the 54th minute when the Yugoslavs went on a goal-scoring spree. India’s best achievement in international football after Melbourne was its gold medal in the 1962 Asian Games in Jakarta. Thangaraj put in a Yashin-like performance in the final, holding a ferocious South Korean attack at bay for 85 minutes before conceding a goal. It was widely reported that the Japanese referee wanted to examine Thangaraj’s hands and boots! Such was his dominance that day. India won the match by a score of 2-1 and that would be the last time the national football team anything of consequence.